It may not come as a surprise, but over 80% of Brits fail to secure their sheds. Michael Fraser, who can be seen on Beat the Burglar has teamed up with Wickes to give the nation some security tips. Out of those who are taking steps to secure their shed, over half (55%) are only using one padlock. Complacency about not being at risk from burglary is meaning that many Brits are lacking in wider security measures for their outdoor areas and despite police records reporting 779,000 domestic burglaries a year in the UK, less than 10% of Brits own a CCTV system and only two in five (38%) residents having alarms installed in their homes. However, as winter nights begin to draw in, Brits are becoming increasingly concerned about being burgled, with over half of respondents reporting that they are most worried about being burgled in the last three months of the year. To help consumers secure themselves and their belongings this winter, Wickes have partnered with reformed ex-professional burglar turned security expert, Michael Fraser. Best known for co presenting the BBC’s “Beat the Burglar” and for being a principal mentor in C4’s “Going Straight”, Michael Fraser is now acting as Wickes’ Security Expert. Within this role, he has developed some exclusive hints and tips to cultivate a little home safety know-how among Brits. “Time and time again, I see people who allow valuable items to mount up in their sheds – a power tool here, a bike there, it’s so easy to do without realising! However, as this research shows, it is often the case that the public are not being vigilant in protecting themselves and their property” says Michael Fraser. One lock on the front door of a property is not enough. You should have at least a 5 lever deadlock as well, like this Yale deadlock. Prominent window locks are a must! Install Wickes uPVC window locks on all windows so they can be seen, especially from the front of the property. Padlock any gates at the back of the property at 1.2m and 2m and make sure you use three Wickes Parliament hinges. Don’t have a calendar in the kitchen facing the back window telling the burglar when you’re not in! 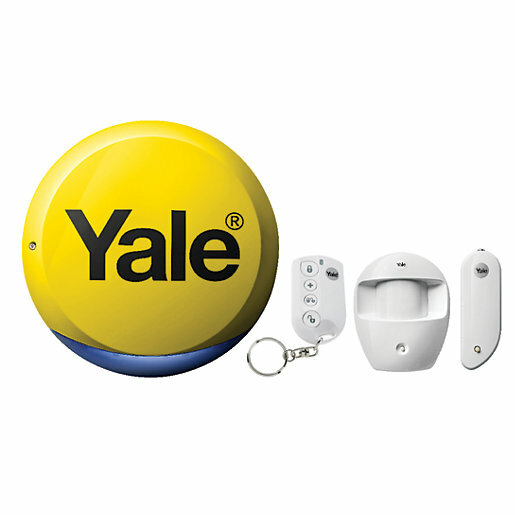 Have a small Yale safe fitted upstairs for valuables and important paperwork. Robert Ashdown, Hardware & Security Category Manager, commented: “At Wickes, we have a large range of security products whether you’re just looking to secure a garden shed or your entire home. Along with Michael Fraser, we hope to provide our customers with all they need for any sized home security project from start to finish”. Wickes has a full home security product range, including everything from alarms, CCTV systems and security lights all the way through to padlocks, latches and safes. This Easy Fit Alarm is exclusive to Wickes. Its components are pre-linked so it’s quick to install, plus it’s extra secure with Enhances Jamming detection and rolling code transmission. Batteries included. The Swann Professional Security Kit has a 8 Channel Recording System and 4 Bullet Style Cameras. This is a versatile system with the ability to add 4 compatible cameras of your choice for full 8 camera monitoring.